A refugee shelter that is treated with insecticide during manufacture would be useful for malaria control at the acute stage of an emergency, when logistic problems, poor co-ordination and insecurity limit the options for malaria control. Tents made of untreated canvas with deltamethrin-treated polyethylene threads interwoven through the canvas during manufacture, 'pre-treated tents', were tested in Pakistan for their impact on malaria vectors. Fixed-time contact bioassays tested the insecticidal activity of the material over 3 months of outdoor weathering. Unweathered tents were erected under large trap-nets on outdoor platforms and tested using wild-caught, host-seeking mosquitoes and insectary-reared mosquitoes released during the night into the trap-nets. The insecticide-treated tents were effective both in killing mosquitoes and reducing blood-feeding. Mean 24 hour mortality was 25.7% on untreated tents and 50.8% on treated tents (P = 0.001) in wild anophelines and 5.2% on untreated tents and 80.9% on treated tents (P < 0.001) in insectary-reared Anopheles stephensi. Blood-feeding of wild anophelines was reduced from 46% in the presence of an untreated tent to 9.2% (P < 0.001) in the presence of treated tents and from 51.1% to 22.2% (P < 0.001) for insectary-reared An. stephensi. In contact bioassays on tents weathered for three months there was 91.3% mortality after 10-minute exposure and a 24 h holding period and 83.0% mortality after 3-minute exposure and a 24 h holding period. The results demonstrate the potential of these pre-treated canvas-polyethylene tents for malaria control. Further information on the persistence of the insecticide over an extended period of weathering should be gathered. Because the epidemiological evidence for the effectiveness of pyrethroid-treated tents for malaria control already exists, this technology could be readily adopted as an option for malaria control in refugee camps, provided the insecticidal effect is shown to be sufficiently persistent. Treating tents with insecticide was originally used as a malaria control tool for nomadic peoples . The early work with DDT and dieldrin had little success owing to the poor adhesion of the formulations (wetable powder) then available, on fabrics [1, 2]. Pyrethroid insecticides in suspension concentrate or micro-encapsulated formulations show better adhesion and residual efficacy and are more suitable for treatment of textiles. This has enabled successful treatment of tents in recent years. Entomological evaluations have shown that canvas tents sprayed with pyrethroids can reduce mosquito feeding and cause high knock-down and mortality [3, 4]. Tents sprayed with permethrin and deltamethrin reduced Anopheles stephensi biting by about 40% and resulted in 75% mortality amongst the blood-fed mosquitoes . The ability of permethrin-treated tents to control malaria was demonstrated when they were implemented in response to an epidemic in a population of nomadic Afghan refugees in Pakistan . The evidence, both entomological and epidemiological, for pyrethroid-sprayed tents being an appropriate tool for malaria control in refugee camps has led to this technology being included in several refugee health care manuals [7–9]. In recent years they have been implemented as a control method in numerous refugee and IDP settings (e.g. Sierra Leone and Mozambique ). It is at the early acute stage of an emergency, when refugee camps are first being established, that poor sanitation, malnutrition and mortality due to disease are at their worst and the environment is particularly suitable for transmission of vector-borne diseases. Conventional responses to malaria control may be difficult due to insecurity, inaccessibility and inadequate inter-agency co-ordination. Organisation and implementation of insecticide spray campaigns is logistically demanding and may not be feasible at this stage. Logistical efforts are more likely to be focused on the delivery of emergency food, medicine, clean water, blankets and shelter. If the shelter materials that are distributed during camp construction were pre-treated, a potentially effective vector control tool could be delivered with no extra demand on logistical resources. Pre-treated polyethylene laminated tarpaulins (Zerofly®) and tents (both Vestergaard Frandsen A/S), have already been demonstrated to cause mortality and reduce blood-feeding of malaria vectors . Untreated plastic tarpaulins, similar to those tested, are frequently distributed to refugees. As an alternative or an addition to plastic tarpaulins, canvas tents are often distributed. Tents made completely of plastic sheeting are unlikely to be suitable as shelter materials as the conditions inside the shelter are considerably hotter and more humid than the canvas tents usually distributed in a refugee camp (Graham & Rowland unpublished data). To address these issues a canvas tent incorporating pre-treated deltamethrin-impregnated polyethylene fibres has been developed. An entomological evaluation of these tents in Afghan refugee camps in Pakistan is presented here. HealthNet International (HNI) maintains a working insectary and testing site at one of their field stations, the Adizai refugee settlement. The insectary rears a fully susceptible strain of An. stephensi. The conditions are maintained at 26 +/- 2°C and 75 +/- 10% RH. Contact bioassays and overnight platform trials with insectary-reared mosquitoes took place at this site. Overnight platform trials with wild-caught mosquitoes took place at the entomological field station in Azakhel refugee settlement. Both sites are located on the banks of the Kabul River, approximately 25 km from Peshawar. The camps have existed for 22 years. The land in Azakhel is waterlogged and the rise in the water table during the spring snow melt and summer monsoon gives rise to innumerable mosquito breeding sites. Mosquito populations begin to rise in April with the majority being culicine species; anopheline densities increase from July. Peak mosquito density occurs in August and density declines in November. Cases of Vivax malaria occur from March to November and Falciparum malaria from August to December. Constructed on the Azakhel site are ten elevated platforms each measuring 6 m × 5 m and surrounded by water-filled 'moats' to exclude any scavenging ants. The tents are made mostly of untreated canvas. Deltamethrin treated polyethylene threads (of the same material used to make Zerofly ®) are interwoven through the canvas fabric during manufacture. This composite material has a cream and blue striped appearance (figure 1). The tents have doors at both ends; each is made up of outer canvas door-flaps and inner mosquito mesh door-flaps. The mosquito mesh door-flaps are made from PermaNet™ polyester netting, which is pre-treated with deltamethrin. 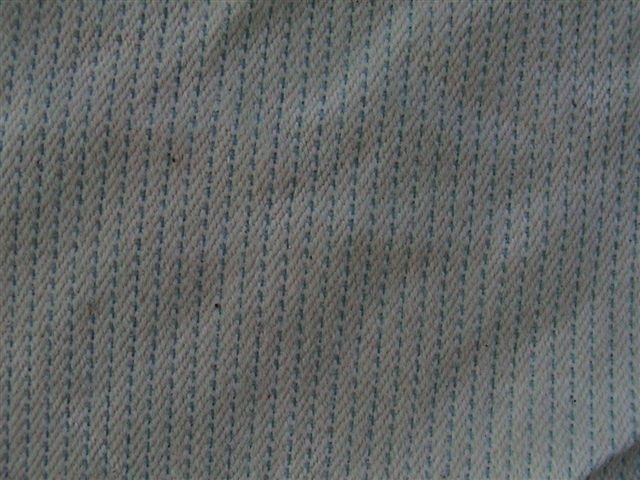 Close-up of tent material: canvas with delatemethrin-treated polyethelene thread woven through. World Health Organization (WHO) plastic bioassay cones were taped to the inner surface of the tents. Non-blood fed, insectary-reared, female, susceptible, An stephensi were exposed to the tent under the cones for three or ten minutes, after which they were held under insectary conditions (26 +/- 2°C and 75 +/- 10% RH) and given access to sugar solution. Knock-down was recorded after one hour and mortality after 24 hours. The method of outdoor, overnight evaluation carried out at the entomological field station has been used previously to evaluate the mortality and behavioural effects of treated tents  treated nets , and treated top sheets [13, 14]. 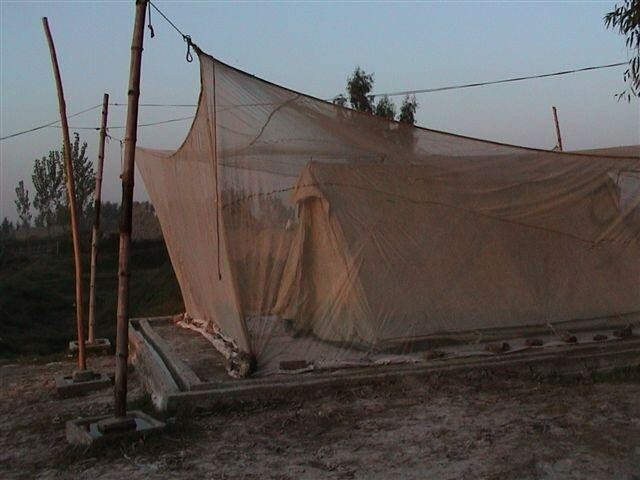 Large trap-nets (length 6 m × height 2.5 m × width 5 m), made of untreated mosquito netting, were erected above ant-proof platforms upon which the tents were erected (figure 2). Four men slept in each tent in local dress (cotton shalwar-chemise), each covered by a woollen blanket. At one end of the tent the doors were securely closed, at the other end the canvas door flaps were tied open whilst the mesh doors hung loose. The closed end was alternated nightly between the two ends of the tent. Tent erected in large trap net for overnight platform tests. For the first half of the night wild, host-seeking mosquitoes were collected from the outside of the trap-nets and released within. Near to the test site calves were tethered under untreated nets to supplement the number of mosquitoes attracted to the site and available for release within the trap-nets. The following morning all mosquitoes were collected from within the trap-nets, separated into dead or alive, and kept in humidified cups with sugar solution for a further 12 hours before scoring delayed mortality. All mosquitoes were categorized as blood-fed or unfed, identified to genus level and the anophelines to species level. End-point indicators used in analysis were: dawn mortality, 24 hour mortality and blood-feeding rate (feeding inhibition). Mortality analysis gives an indication of the potential mass effect on mosquito populations and blood-feeding rate an indication of personal protection. These tests took place during November 2003. All field staff gave informed consent and were given chloroquine and proguanil prophylaxis. The procedures used were approved by the Ethics Committee of the London School of Hygiene and Tropical Medicine. Overnight tests were carried out with insectary-reared mosquitoes in January and February 2004, after the natural mosquito season had ended. Tents and trap-nets were erected as above. A cow was tethered within the tents in the place of sleepers. An stephensi and the other local vectors are highly zoophilic and cattle make a suitable alternative host. Approximately 400 unfed, 5 – 7 day old, insectary-reared, An stephensi were released into the trap-nets at dusk, collected at dawn, put in holding cages with access to sugar solution and held in insectary conditions for 24 hours. Mosquitoes were sexed and categorized as blood-fed or unfed and dead or alive. Only female mosquitoes were included in the analysis. End-points for analysis were 24 hour mortality and blood-feeding rates. Overnight platform tests with wild-caught host-seeking mosquitoes in the presence of a treated tent resulted in significantly higher mosquito mortality and significantly lower blood-feeding rates than when an untreated tent was tested (table 1). The proportion killed approximately doubled for culicines (P < 0.001) and anophelines (P = 0.001), whilst blood-feeding was reduced five-fold (culicines P = 0.001, anophelines P < 0.001). Blood-feeding and mortality in overnight platform trials with wild-caught mosquitoes and human sleepers. Notes: 1. Mean percentage blood-fed, mortality and 95% confidence limits are back-transformed from values calculated by the blocked logistic regression model. 2. Significance levels between results on the treated tent and untreated tent for each genera are indicated with asterix: * = P = 0.001 ; **P < 0.001. 3. The mean number of mosquitoes per treatment per night does not provide information about the relative attractiveness of each test item: enclosed platforms were used, wild-caught mosquitoes were manually introduced to these and were then unable to leave the platform. These data are included for reference purposes only. These means do not differ significantly by t-test. 4. Due to low numbers of individual species all anophelines have been grouped. In overnight tests with insectary-reared An stephensi and calves tethered inside the tents baseline mortality and blood-feeding (i.e. on the untreated tent) were higher than in the aforementioned overnight tests with wild-caught mosquitoes and human sleepers (table 2). In the presence of the deltamethrin treated tent there was a significant increase in mortality and reduction in blood-feeding of the insectary-reared mosquitoes. Mortality increased 15-fold from mortality on the untreated tent (P < 0.001) and blood-feeding was reduced to less that half of that seen in the presence of the untreated tent (P < 0.001). Blood-feeding and mortality in overnight platform trials with insectary-reared An stephensi and calves as bait. Notes: 1. Mean percentage blood-fed, mortality and 95% confidence limits are back-transformed from values calculated by the blocked logistic regression model. 2. Significance levels between results on the treated tent and untreated tent for each genera are indicated with asterix: * = P = 0.001; **P < 0.001. 3. The mean number of mosquitoes per treatment per night does not provide information about the relative attractiveness of each test item: enclosed platforms were used and one batch of insectary reared mosquitoes was released at the start of the evening (6.30–7 pm). These data are included for reference purposes only. These means do not differ significantly by t-test. Both the 3 and 10-minute exposure contact bioassays, resulted in 100% knock-down of mosquitoes within one hour of exposure (table 3). Some recovery during the holding period led to mortality being less than 100% after 24 hours in both the 3-minute and 10-minute tests (93.2% and 97.4% respectively). Knock-down and 24 hour mortality in contact bioassays on the inside surface of insecticide-treated tents after weathering. Notes: 1. Mean percentage knock-down, mortality and 95% confidence limits are back-transformed from values calculated by the blocked logistic regression model. 2. Tests on an untreated tent were carried out as a control. 24 hr mortality was never more than 5%. After one month of weathering one hour knock-down and 24 hour mortality were greater than 95% in both the 3-minute and 10-minute tests. Some decline in insecticidal effect was seen after two and three months weathering, both knock-down and mortality after three months remained greater than 80% in 3-minute exposure bioassays, and greater than 90% in 10-minute exposure bioassays. The pre-treated canvas-polyethylene tents clearly affect mortality and blood-feeding rates of both wild and insectary-reared malaria vectors. The lower control mortality and higher treatment mortality observed with insectary-reared mosquitoes cannot be confidently assigned to genetic or behavioural consequences of insectary colonization, because of possible confounding effects due to the use of cattle as bait and testing during the cooler months of January and February (tests with wild mosquitoes were done during November using humans as bait). Whilst the magnitude of the effect differs between the trials with insectary-reared and with wild-caught mosquitoes, the conclusions to be drawn are the same. The manufacturer of the tents tested here have combined the technology of the deltamethrin treated polyethylene (from which Zerofly® are constructed) with the accepted design of a canvas ridge-pole tent. Whilst tents made entirely of plastic sheeting were shown to be effective against malaria vectors on a previous occasion , tents of canvas and polyethylene may be more suitable for use in refugee camps. The superior design of these canvas-polyethylene tents was commented on by the refugee helpers involved in this trial who had also been involved in the trial of plastic tents. The sleepers reported that the canvas tents were cooler and less humid than the plastic tents (no comparative temperature or humidity data were collected during this study). Further entomological studies are needed to assess the persistence of the insecticide. A canvas tent will be in use for longer than a plastic tarpaulin and it is, therefore, important that the residual life of the insecticide treatment is documented and, if necessary, prolonged by appropriate use of UV filters. Persistence of insecticide that gives >90% mortality in 10-minute exposure cone bioassay tests after a year of weathering would be an acceptable target. Deltamethrin has shown good persistence when sprayed on the inner surface of double-sheeted tents  but persistence after spraying on outer surfaces of single sheeted tents has not, to our knowledge, been examined. Outdoor weathering of the tent should continue to be monitored, with contact bioassays conducted on a monthly basis and with further overnight trials after a period of several months to one year. The use of pyrethroid-treated tents is already established as a malaria control intervention. A technology that enables tents to be pre-treated with insecticide during manufacture and be shown to retain insecticidal efficacy for up to one year would improve the feasibility of malaria control during the acute stage of an emergency. These findings on 0 – 3 month weathered tents demonstrate that this technology is equivalent to deltamethrin sprayed canvas tents over this period. If the criteria of adequate insecticidal persistence is met, this technology could be recommended as a good tool for malaria control in refugee camps, without the need for extensive disease control trials. HealthNet International's Malaria Control Programme is funded by the United Nations High Commissioner for Refugees and the European Commission. The study was funded in part by the WHO Pesticide Evaluation Scheme and in part by Vestergaard Frandsen A/S. MR is support by the UK Department for International Development and the Gates Foundation. None of these donors accept responsibility for any information presented or views expressed. The mention of any specific companies and/or products does not in any way imply that they are recommended or endorsed by the Worth Health Organization in preference over others that are not mentioned. KG drafted the paper and prepared the final version, participated in the design, supervised the study and analysed the results; HR assisted in the design and supervised the field work and mosquito identification; MA assisted in study design, field work and mosquito identification; KM assisted in study design, field work and mosquito identification; IK assisted in study design, field work and identification; MR assisted in study design and revision of the paper. All authors have read and approved the final manuscript.